Shortly after Trump’s victory last year, voters had less negative expectations for how his election would affect race relations. In November 2016, nearly half (46%) said it would lead to worse race relations, while 25% expected his election to lead to improved race relations (another 26% expected little change). In 2008, voters were more optimistic about how Barack Obama’s election would affect race relations than they were after Trump’s victory. In November 2008, 52% said Obama’s election would lead to better race relations in the country. A year later, fewer Americans (36%) said race relations had improved, but just 13% said Obama’s election had made race relations worse. 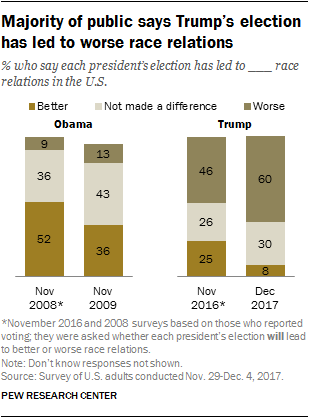 That was little changed from November 2008, when 9% of voters said Obama’s election would lead to worse race relations. The national survey by Pew Research Center, conducted Nov. 29-Dec. 4 among 1,503 adults, finds that the public has negative assessments of the overall state of race relations in the U.S. A majority (56%) says race relations are generally bad, while 38% say they are generally good. Since May 2016, there has been an increase in the share of Americans who say race relations are getting worse – from 38% then to 44% today. Over the same period, the share saying that too little attention is paid to race and racial issues also has risen. Today, 44% say too little attention is paid to racial issues, while 32% say there is too much focus on race; 19% say about the right amount of attention is paid to racial issues. In May 2016, the public was divided over whether racial issues had received too much (36%) or too little (35%) attention; about a quarter (26%) said they had received about the right amount of attention. Opinions about the overall state of race relations have grown more negative in recent years. Positive views reached a high shortly after Obama’s inauguration in 2009, when 66% said race relations were generally good. However, public views of race relations declined significantly in 2014 and 2015, following a number of high-profile shootings of unarmed black men. In August 2014, about as many said race relations were generally good (47%) as generally bad (44%). And by May 2015, views had grown even more negative: 61% called race relations generally bad, compared with just 34% who said they were generally good. 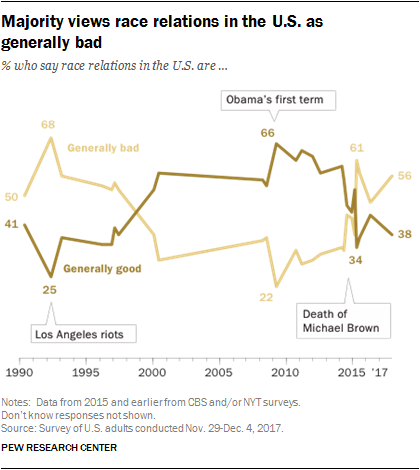 A year later, in a major survey of the public’s attitudes about race and racial inequality, opinions about the state of race relations were divided (48% generally bad, 44% generally good). Today, a 56% majority expresses a negative view of race relations, while 38% say relations are generally good. As in the past, whites have a more positive view of race relations than do blacks or Hispanics. Currently, 40% of whites say race relations are generally good, compared with 28% of blacks and 33% of Hispanics who say this. The racial gap in views of race relations was similar a year ago: At that time, 46% of whites said race relations were good, as did 34% of blacks and 37% of Hispanics. 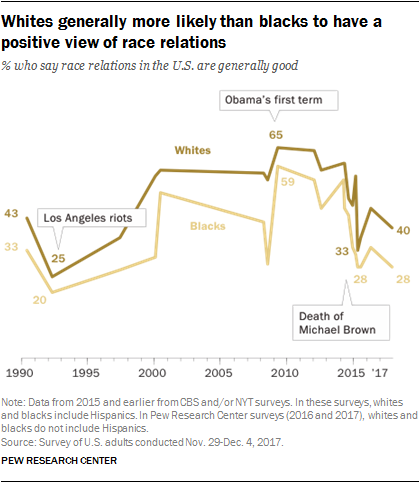 Over the past year, there also has been a rise in the share of Americans who say race relations are “getting worse.” In this case, however, blacks’ views have changed more than the views of whites. Overall, more Americans now say race relations in the U.S. are getting worse (44%) than say they are staying about the same (37%); just 17% say they are getting better. By contrast, in May 2016, about as many thought relations were getting worse (38%) as said they were holding steady (41%); 19% said they were getting better. Among blacks, about half (51%) now say race relations are getting worse, up 14 percentage points since last year. 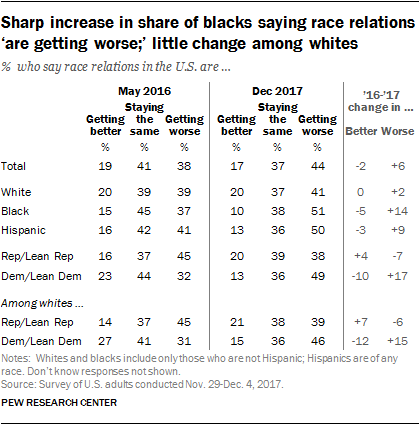 Opinion among whites remains divided: While 41% think relations are getting worse, about as many (37%) say they are staying the same; 20% think race relations are getting better. There also have been partisan shifts in opinions about the trajectory of race relations. Nearly half of Democrats and Democratic-leaning independents (49%) say race relations are getting worse, compared with 32% in May 2016. Republicans and Republican leaners are now somewhat less likely to say race relations are getting worse (45% then, 38% today). Even so, about as many Republicans currently say race relations are getting worse (38%) as say they are staying the same (39%). Just 20% of Republicans say race relations are getting better, about the same share who said this in May 2016 (16%). This pattern holds for white Democrats and Republicans. Among white Democrats and Democratic leaners, 46% say relations are getting worse, up 15 percentage points from 2016 (31%) Fewer today say race relations are getting better than said this last year (15% now vs. 27% then). Among white Republicans and Republican leaners, about as many say relations are worsening (39%) as say they are staying the same (38%); 21% say they are improving, up seven percentage-points from 2016. Overall, 60% of Americans say Trump’s election has led to worse race relations in the U.S. In November 2016, in a callback survey of registered voters who said they voted in the election, 46% said they thought Trump’s election would lead to worse race relations. Most of the increase in negative opinions has come among Republicans and Republican-leaning independents. Today, 25% say Trump has made race relations worse, while 17% say he has made them better and 53% say he has not made a difference. In November, just 10% of Republican voters expected Trump’s election to make race relations worse, while nearly half (48%) expected his election to lead to improved race relations; 38% anticipated little change as a result of his victory. By contrast, there has been little change among Democrats and Democratic leaners. Shortly after the election, 81% of Democrats said Trump’s election would lead to worse race relations; today, 83% say his election has led to worse race relations. Views of Obama’s impact on race relations also grew less positive after he became president. In his case, the shift occurred across party lines. Before the election, 70% of Democratic voters said his election would lead to better race relations. About a year later, 52% of Democrats said his election had led to better race relations. There also was a decline among Republicans (from 33% before the election to 21% the following year). An even higher percentage (86%) says there are strong conflicts between Republicans and Democrats, including 64% who say these conflicts are very strong. Six-in-ten say there are strong or very strong conflicts between the rich and poor. Fewer describe conflicts between people who live in cities and those who live in rural areas, or between young people and older people as strong (37% and 35%, respectively). Views on group conflict in America are little changed from 2016. For instance, a year ago 85% said there were at least strong conflicts between Republicans and Democrats and 66% said this about blacks and whites. Most demographic and political groups see strong or very strong conflicts between whites and blacks, but there are significant differences across groups in how widely this view is held. 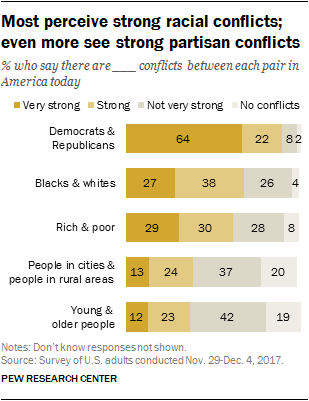 More blacks than whites see at least strong conflicts between their two groups (76% vs. 61%), including close to twice as many who say they are very strong (38% vs. 21%). Nearly seven-in-ten Hispanics (69%) also see strong conflicts, including 42% who say they are very strong. About three-quarters (74%) of Democrats and Democratic leaners say conflicts between blacks and whites are strong or very strong. A smaller majority of Republicans and Republican leaners (54%) say the same. The partisan gap on conflicts holds among whites: White Democrats (70%) are more likely than white Republicans (54%) to say there are at least strong conflicts between blacks and whites in America today. And while at least 70% of Democrats across racial groups say there are strong conflicts between the two racial groups, there are differences by race in views of intensity: A greater share black Democrats (38%) than white Democrats (23%) say there are very strong conflicts between whites and blacks. More think there is too little attention on race and racial issues in the U.S.
An increasing share of the public thinks too little attention is paid to race and racial issues in the country today: 44% say this now, while 32% say race and racial issues receive too much attention and 19% think the amount of attention is about right. In May 2016, a smaller share (35%) said too little attention was being paid to race in the country. 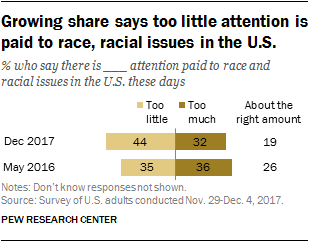 There are stark differences across demographic, partisan and ideological groups in attitudes about the level of attention on racial issues; still, across most groups, the share saying there is too little attention has grown since 2016. Whites are divided in their views of the level of attention paid to race and racial issues: While 36% think there is too much, about as many (38%) say there is too little. By contrast, fully 68% of blacks say there is too little attention paid to race today; just 15% say there is too much. A 55% majority of Hispanics also say there is too little attention on race. Young adults are more likely than older adults to think there’s too little attention paid to race and racial issues in the country: About half of those under 30 (53%) say this, compared with four-in-ten among those ages 65 and older. The partisan gap on attention to racial issues in the U.S. is wide: By about three-to-one, more Republicans than Democrats say there is too much attention paid to racial issues (53% vs. 18%). While conservative Republicans are somewhat more likely to say this than are moderate and liberal Republicans, pluralities across all ideological groups think too much attention is paid. By contrast, a 60% majority of Democrats think there is too little attention, including fully 70% of liberal Democrats. There are modest differences in views by levels of educational attainment: 50% of college graduates say there is too little attention to racial issues, compared with 42% of those with less education. The gap across education levels is wider among whites, and this gap has grown since 2016. A plurality of whites with a college degree (46%) say there is too little attention on race today, up 16 percentage points from 2016 (30%). By contrast, about a third of whites without a college degree (34%) think there is too little attention paid to race today; a quarter (25%) said the same last year.